Tonkinese cats resulted from crossbreeding Siamese and Burmese. Like their two founding breeds, both of which originated in Thailand, they are medium-sized, muscular, energetic, intelligent, and curious. They have a modified wedge-shaped head with somewhat large wide-set ears. They tend to be a bit less demanding and vocal than Siamese cats, and they come in a greater variety of colors and patterns. Some say that Tonkinese closely resemble the original Siamese before the modern, elongated type became popular. 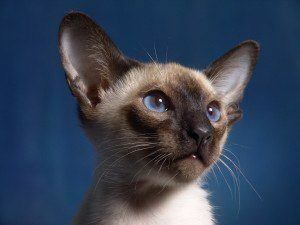 At first glance they may look like Siamese cats, but once you know what to look for you can see both Siamese and Burmese traits combined in a uniquely “Tonk” way–the best of both! However, the Cat Fanciers’ Association did not consider the Tonkinese a unique, established breed until 2001. Because Tonks inherit coat colors and patterns from both the Siamese and Burmese, they can be solid (from its Burmese heritage), pointed (from the Siamese), or mink. Note that though the Burmese coat is termed “solid”, it is really a pointed pattern with very little contrast between the points and the body fur. Mink is unique to the Tonkinese, showing darker points, less contrast between these and the body fur than Siamese points, but greater contrast than Burmese points. Thus, it is intermediate between Burmese and Siamese. The four basic colors are natural (= seal), blue, champagne (= chocolate), and platinum (= lilac). The contrast between points and body is caused by a temperature-senistive genetic mutation, so warmer areas of the body are lighter and cooler areas are darker. The degree of sensitivity to temperature is also genetically determined–the Burmese genes are less sensitive, so there is less contrast. Body color darkens with age in all patterns. And while Siamese cats only have blue eyes, Tonkinese can have different eye colors. Typically, solid Tonks have gold or green eyes, pointed cats have blue, and mink cats have aquamarine. Tortie, tabby, and red point variations are also possible, but as with Siamese these are only officially recognized in some cat clubs and associations.